EXCAVATORS 38 E&MJ • NOVEMBER 2017 www.e-mj.com In many ways, excavating concepts have changed little since the introduction of the first steam shovels into mining in the late 1800s. And, while that was rev- olutionary in terms of how mines were designed, and the types of orebody that could be mined profitably, developments that have come since have essentially been focused on the technology used rather than the concepts. Rope shovels and draglines, the key mining machines up to the 1970s, were then joined by the first generation of large hydraulic excavators — some of which worked, while others did not. Buck- et-wheel excavators also came into their own in the right conditions, and again, it sometimes took a lot of rather expensive experimentation to discover whether a machine was indeed suitable for the task it had been set. In addition, technology advances have often overtaken tradition, such as the replacement of the initial bucket-wheels in the Canadian oil sands by conventional excavators once the oper- ating cost balance tipped in their favor. Today, the market for mining excava- tors is wider than it has ever been, with continuous cutting technology having been transferred successfully from the construction industry. What is more, man- ufacturers are now pushing the boundar- ies with systems that have been confined to soft-rock applications, bringing closer the possibility of high-volume continuous production in harder material. 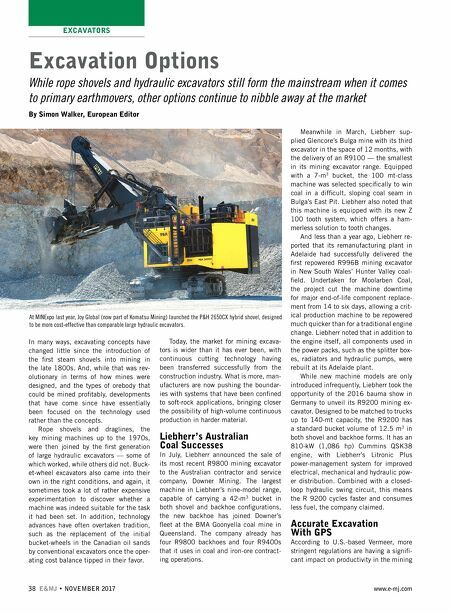 Liebherr's Australian Coal Successes In July, Liebherr announced the sale of its most recent R9800 mining excavator to the Australian contractor and service company, Downer Mining. The largest machine in Liebherr's nine-model range, capable of carrying a 42-m 3 bucket in both shovel and backhoe configurations, the new backhoe has joined Downer's fleet at the BMA Goonyella coal mine in Queensland. The company already has four R9800 backhoes and four R9400s that it uses in coal and iron-ore contract- ing operations. Meanwhile in March, Liebherr sup- plied Glencore's Bulga mine with its third excavator in the space of 12 months, with the delivery of an R9100 — the smallest in its mining excavator range. 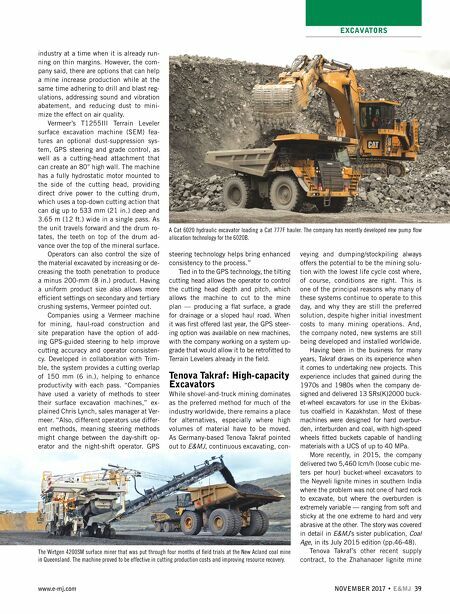 Equipped with a 7-m 3 bucket, the 100 mt-class machine was selected specifically to win coal in a difficult, sloping coal seam in Bulga's East Pit. Liebherr also noted that this machine is equipped with its new Z 100 tooth system, which offers a ham- merless solution to tooth changes. And less than a year ago, Liebherr re- ported that its remanufacturing plant in Adelaide had successfully delivered the first repowered R996B mining excavator in New South Wales' Hunter Valley coal- field. Undertaken for Moolarben Coal, the project cut the machine downtime for major end-of-life component replace- ment from 14 to six days, allowing a crit- ical production machine to be repowered much quicker than for a traditional engine change. Liebherr noted that in addition to the engine itself, all components used in the power packs, such as the splitter box- es, radiators and hydraulic pumps, were rebuilt at its Adelaide plant. While new machine models are only introduced infrequently, Liebherr took the opportunity of the 2016 bauma show in Germany to unveil its R9200 mining ex- cavator. Designed to be matched to trucks up to 140-mt capacity, the R9200 has a standard bucket volume of 12.5 m 3 in both shovel and backhoe forms. It has an 810-kW (1,086 hp) Cummins QSK38 engine, with Liebherr's Litronic Plus power-management system for improved electrical, mechanical and hydraulic pow- er distribution. Combined with a closed- loop hydraulic swing circuit, this means the R 9200 cycles faster and consumes less fuel, the company claimed. Accurate Excavation With GPS According to U.S.-based Vermeer, more stringent regulations are having a signifi- cant impact on productivity in the mining Excavation Options While rope shovels and hydraulic excavators still form the mainstream when it comes to primary earthmovers, other options continue to nibble away at the market By Simon Walker, European Editor At MINExpo last year, Joy Global (now part of Komatsu Mining) launched the P&H 2650CX hybrid shovel, designed to be more cost-effective than comparable large hydraulic excavators.